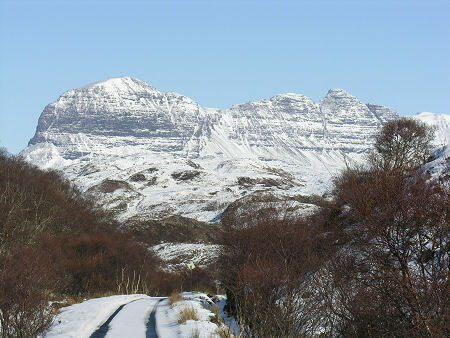 What's the best mountain in Scotland? 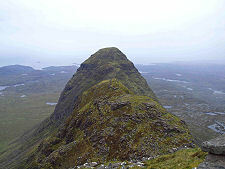 Let's all be glad that tastes differ, but for us the best mountain in Scotland has to be Suilven. 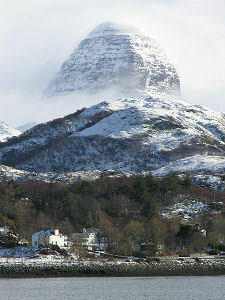 A "mere" 2,389ft high with a name said to come from the Norse "Pillar Mountain": which shows, not surprisingly, that the Vikings saw its seaward profile first. 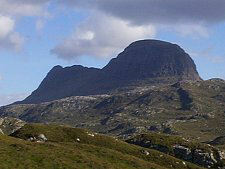 When viewed from Lochinver, Suilven looks magnificent and impossible: a policeman's helmet of rock. 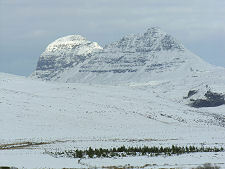 When viewed from the main Ullapool road to the east, it appears spiky, like something out of Tolkien. 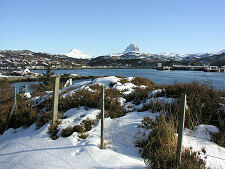 From the north or south, however, Suilven shows itself to be a long bumpy ridge, with a noticeable waist somewhere near the middle. This is the key to any ascent. 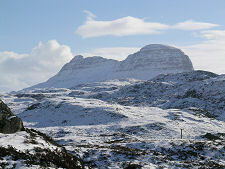 There are several ways of approaching Suilven. But first a word of warning. This is not a high mountain, and the climbing is relatively straightforward. But it is a remote lump of rock carefully placed in the middle of a lochan-strewn wilderness that stretches for many miles in every direction. Don't for a moment think you're in for an easy day out. 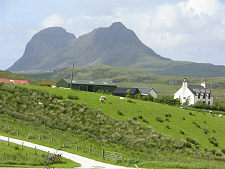 Probably the most popular route to Suilven starts a mile or so outside Lochinver on a minor road leading to the community-owned Glencanisp Lodge, which now offers B&B. There is some parking available in the walkers' car park at the point the road becomes a drive, about half a mile short of the lodge. 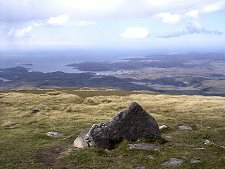 The only alternative is the walk in from Lochinver itself. From the parking area the path goes through the grounds of Glencanisp Lodge: follow the signs taking you to the left around the back of the house. Once clear of the grounds you embark on a lovely undulating walk along a superb stalkers' path. 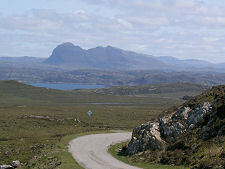 You stay on this for four or five miles, watching Suilven's shape steadily change from end-on to side-on. After you feel sure you must have gone too far along the path, you finally come across the cairn that marks the spot at which you need to strike out reasonably directly towards the low point of the ridge, now slightly west of south of you. There was a time when this path to the foot of the gully leading up to the ridge could fairly have been called a boggy morass. Considerable investment by the Assynt Foundation since it took over ownership of the estate in June 2005 means this part of the path is far better than it used to be. The climb up the gulley is a hard pull in anyone's language, and the erosion in the gully has become noticeable worse over the years. 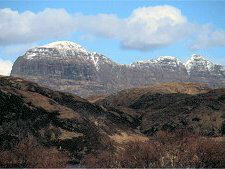 But you gain height quickly, and the views north, to Quinag and beyond, open out nicely. Gaining the ridge reveals views south taking in Stac Polliadh that are every bit as good as those you've been admiring to the north. Once on the ridge you simply turn right, make your way through a gap in a magnificent and magnificently pointless dry stone wall built across the line of the ridge, and after some minor scrambling, make your way up to Caisteal Liath, the higher western summit of Suilven. You know you've arrived when you see, on our last visit at least, a cairn which, to borrow Muriel Gray's joke, must have received an Arts Council grant. Otherwise the summit is a surprise, feeling like a gently sloping grass field perched on top of the world. It would be going a little far to suggest you could hold a football match on top (fetching the ball after a goal would rapidly lose its novelty) but it's certainly not what you expect to find on top of the fearsome-looking Pillar Mountain. 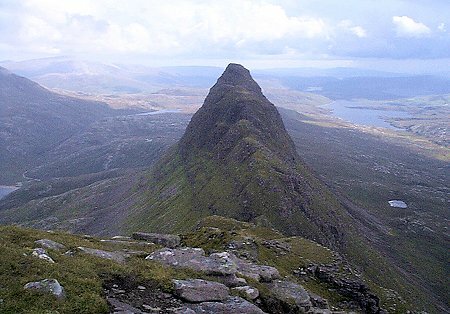 The eastern end of Suilven's ridge, Meall Meadhonach, is narrower and peakier, but fortunately lower, as gaining it requires some scrambling skill and a good head for heights. The top is, we are told, as flat as a billiard table, and given the awkwardness of reaching it we are happy to take this on trust! So then it's back down the eroded gully and across the peaty moor before finishing the day with the trek back to your car or the longer one to Lochinver. Magnificent views and a wonderful - if quite long - day out on the best mountain in Scotland. 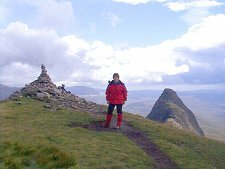 The alternative approach to Suilven is from the south, starting at a car park south of Inverkirkaig which gives access to a path leading to the Falls of Kirkaig: and past them to Fionn Loch, and Suilven beyond. 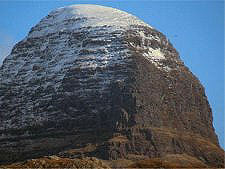 Suilven is 2,389ft or 731m high. The route described here is some 15 miles or 25km long in total.